PAYSON, UT--(Marketwired - July 14, 2016) - Tatum Peterson is 4-years-old and has Aicardi Syndrome which is a neurological and seizure disorder. She is missing parts of her brain and cannot walk, sit up, talk or hold her head up. She is also blind. Even with her struggles, Tatum finds a lot of joy in her life; one of her favorite things is feeling the wind on her face during the marathons, half marathons and 5K races her fit family of seven run as a unit. The family is well known in the race community as Team Tatum Tots. Tatum's mom, Katie, applied online at AID.org for a special racing jogger saying April was their last race for Tatum because she was too big to fit comfortably, and safely, in her current jogger stroller. "We had to restrain her legs and her head was hitting the shade. We were devastated. Running is the one thing our entire family can do regardless of disabilities." Advocates for Individuals with Disabilities -- Foundation (AID.org) sprang into action. Spokesperson Jennifer Rogers said, "The Peterson's should be rewarded for promoting health and wellness and spending quality time with family. 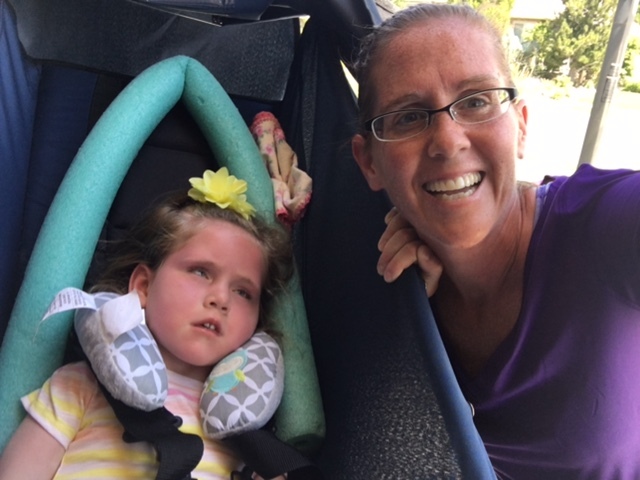 We know there are a lot of needs they have beyond a jogger stroller, but we are thrilled to have Tatum feel the wind in her face as she crosses another finish line." For those with disabilities in need of assistance, please visit www.aid.org. As Civil Rights Champions, AID.org was formed in January 2016 in order to improve the lives of individuals with disabilities through charitable gifts, opportunities and the removal of discriminatory barriers. By spearheading a rapid and widespread wave of compliance through educational and affirmative enforcement actions, AID.org not only rapidly brings non-compliant public accommodation into ADA compliance but also acts as a self-funding catalyst for the charitable AID Foundation. The AID.org Foundation is a growing resource for any individual with a disability looking to receive help with various issues relating to their disability or compelling needs such as: wheelchair access, medical equipment, and much more. Advocates for Individuals with Disabilities - Foundation aims to help improve the lives of 3 to 4 individuals with disabilities per day.